Sleek, sophisticated, and unmistakably Saab, the Swedish carmaker says that the all-new 9-5 saloon signals the dawn of a new era for the Saab brand. With progressive, confident styling, and advanced technology, Saab’s distinctive new flagship will bring a fresh, alternative choice to the premium saloon segment when it goes on sale in 2010. The clean, sculpted shape embraces the purity of Scandinavian design, and its dramatic wraparound window graphic echoes Saab’s aviation heritage. With styling inspired by the award-winning Aero X concept car and a muscular, low-slung stance, the new 9-5 heralds the introduction of a bold and expressive design language. The array of high-tech features on offer includes: an aircraft-inspired head-up information display (HUD ); adaptive headlights (Bi-Xenon Smart Beam ); adaptive cruise control; Saab DriveSense adaptive chassis with real-time damping control; keyless entry and starting; dual-zone climate control; dynamic parking assistance, and Saab XWD with eLSD: the industry-leading all-wheel-drive system. The all-turbo powertrain line-up is the broadest ever offered by Saab, carrying forward Saab’s rightsizing engine strategy focusing on responsible performance through the development of highly efficient four cylinder turbo engines. There is a choice of three fuels – petrol, diesel, and E85 bioethanol – and with diesel power, the new 9-5 offers CO2 emissions as low as 139 g/km. Saab claim that the new 9-5 features progressive Scandinavian design, sporty driving and responsible performance. 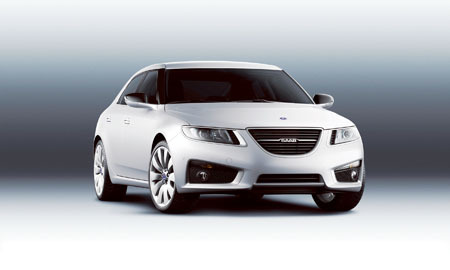 And that it is defined and equipped by Saab as its top-of-the-line contender in the premium saloon segment. It adds that the all-new 9-5 is the most technically advanced car ever produced by the company. It remains to be seen if the combination of head-turning good looks with cutting-edge driving technology captures the hearts and pockets of European motorists. Is this indeed the dawn of a new era for Saab?